This post brought to you by Chase Mortgage Banking . The content and opinions expressed below are that of Modest Money. If you read this blog very much, you know I talk about real estate a lot. Generally, buying a home can be one of the best financial decisions you’ll make in your life. The financial crash of the last decade put the brakes on home sales in most markets. But this also resulted in the lowest-seen interest rates in living memory. Home ownership is a central part of a healthy economy, and the government did a lot to buoy the real estate sector using this and other tactics. But as the homebuying market has thawed, many factors threaten to push interest rates for 30-year fixed loans above 4%. So we’ve got two big forces pushing potential homebuyers in different directions: 1) a better overall economy with the kind of financial security that allows people to buy homes, and 2) increasing interest rates, meaning those who buy today will pay thousands more than those who bought two years ago, for a house of the same price. So what are real people doing in response to these factors? 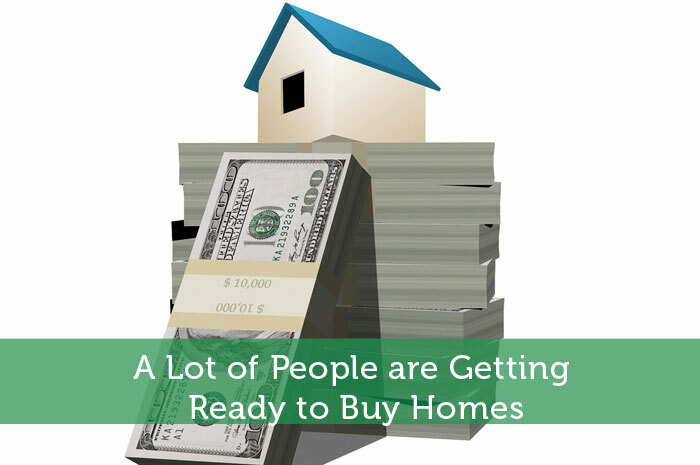 A survey by Chase Mortgage Banking indicates that roughly 3 in 10 Americans want to buy a house soon. 43% of those surveyed think that it’ll be easier to get a mortgage loan now than it was a year ago (there’s the improving economy again). Though rising, interest rates are still low, and this is a huge factor driving first time buyers to meet with their mortgage lenders. But it turns out that the rising cost of rent is the bigger driving force that’s motivating a new generation of would-be homeowners, with 20% of survey respondents citing this as their number one reason to buy. People are realizing (as I like to harp on) that equity is an amazing thing, creating wealth for you, instead of creating wealth for a landlord. And for those who are already homeowners, 20% said their desire to make an upgrade from their current home is their number one reason to buy. Prospective homebuyers surveyed were most unified in a shared anxiety that, perhaps, they haven’t acted soon enough. Thousands of people are settling comfortably into their second, third, fourth (or more) year of home ownership, enjoying the bottom of the barrel interest rates that this fact entails. Given a 30-year mortgage, even a 1% increase in interest can mean tens of thousands more paid over the lifetime of the loan. I personally don’t feel that this should be a deterrent for people on the market for a new home. The other perks of homeownership are too good to pass up. But that doesn’t mean that you shouldn’t learn more about it. The My New Home YouTube channel is an invaluable resource courtesy of Chase and I, of course, have plenty of material on this subject. It’s important to learn before you buy, as only 1 in 4 prospective homebuyers surveyed could answer most simple questions about the process. 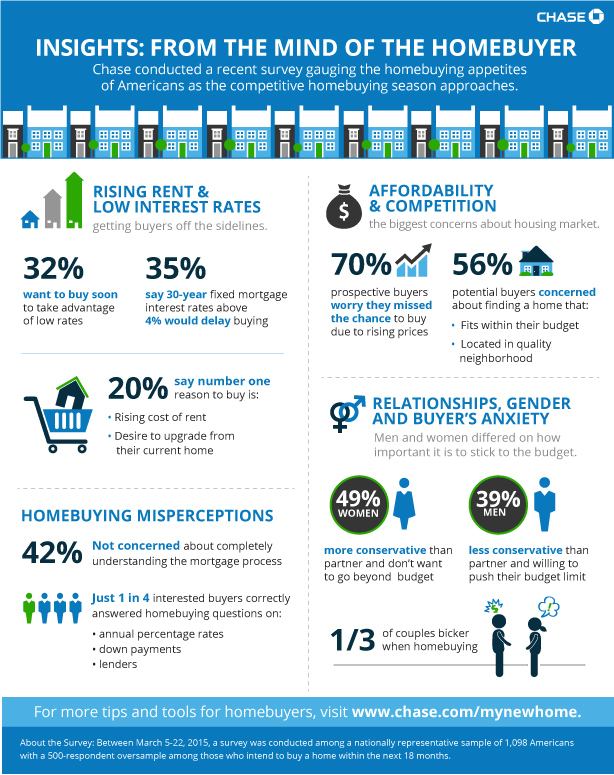 42% communicated that their lack of knowledge about the mortgage process wasn’t a cause for concern. I agree that you don’t have to know everything about home real estate in order to buy a house, but you should also get all of the knowledge you can, it will save you money and a lot of headaches. And it’s a process you’ll be going through with thousands of homebuyers across the nation. You can also visit Chase Mortgage Banking for additional tools and information, like a mortgage rate calculator, which is available to all homebuyers.